There are other types of optical disk media in addition to CDs, DVDs, HD DVDs, and BLU RAY discs. These other optical discs have different sizes than the standard CD size of 12 cm or 4.75 inches and are different in structure and form than the CDs, DVDs, etc. WORM is an acronym for Write Once Read Many times and was first introduced in the 1980s. 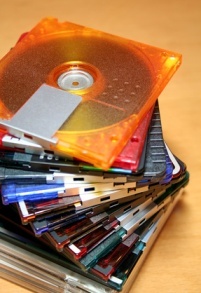 These discs are similar to the recordable CD, DVD, and Blu ray formats in that once the disc is full you can no longer record to the disc or erase the information on it and then reuse it. The WORM optical disc comes in a variety of different sizes with the most popular sizes being the 12 inch and 5.25 inch formats. A significant difference with other optical disk media is that these discs are not used bare but rather in a special plastic cartridge. Because of this and other technological differences, these discs require their own drive and cannot be read in standard CD, DVD, or BLU RAY drives. The magneto-optical disc or MO disc is a non-CD size erasable optical disk format that was introduced late in the 1980s. Like the WORM disks, these discs are housed and used in plastic cartridges and cannot be played in standard optical disc drives. The common sizes for MO optical media are 5.25 inches, 3.5 inches, and 2.5 inches (the Sony MiniDisc).